I’ve read and reviewed a few of Kim Harrison’s books for this blog and they’ve been met with only mild appreciation. But that has changed with The Turn. This prequel novel sets the stage for The Hollows series and as such, introduces the characters (for thosewho are not tremendously familiar with them) and reminds those who know the series well, of the humble beginnings for The Hollows. Trisk is an elf, working to be a respected geneticist so that she can keep an eye on human science so that it doesn’t kill off her own people. She has been successful in creating a specific, hardy tomato, and she’s worked with a human to ensure a virus weapon he’s created isn’t harmful to Inderlanders ( the supernatural species who share the earth with humans [unbeknownst to humans]). Everything seems good, with only one hitch. Kalamack. He’s a rival and he’ll stop at nothing to sabotage her work – including combining the potent virus with her genetically modified tomato, creating a deadly food that is rapid to spread and quick to kill. So quick, in fact, that nearly one-quarter of the human population is killed off in short order from eating any food with a hint of tomato in it (such as ketchup or pizza sauce). Now the Inderlanders are almost equal in number to the humans and they need to start making some decisions on whether or not to reveal themselves to the humans and how much help they should offer during this time of crisis. And so begins The Hollows. I definitely enjoyed this book much more than the other books in The Hollows that I’ve read, and I suspect a great deal of that enjoyment comes from not needing to know what happened before. However…. I still tend to feel that Harrison is over-writing. This book comes in at over 400 pages and yet so little actually happens. Yes, what happens is kind of big time (a quarter of the population dies, after all) but really this is just so simple. Tomatoes. Rivalry. Death. Stretched on and on. If there’s another immediate follow-up to this book, I’d be really interested in reading it, but if the next new book is later in the series, I think I’ll pass. Looking for a good book? 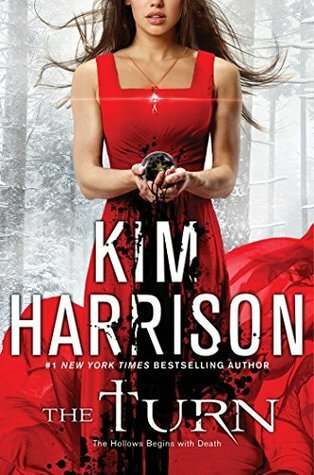 The Turn is Kim Harrison’s prequel to her Hollows series and does a really nice job of explaining how the world came to be in the shape it is her for Rachel Morgan in The Hollows series.